Is Smart Balance Peanut Butter Healthy? Smart Balance is a company that makes food products with reduced levels of trans fatty acids, fat and saturated fat, as well as foods with enhanced nutrition. The company manufactures a peanut butter with more omega-3 fatty acids due to the inclusion of flax oil. This type of peanut butter is only slightly healthier for you than regular peanut butter, providing you with less saturated fat and sugar. 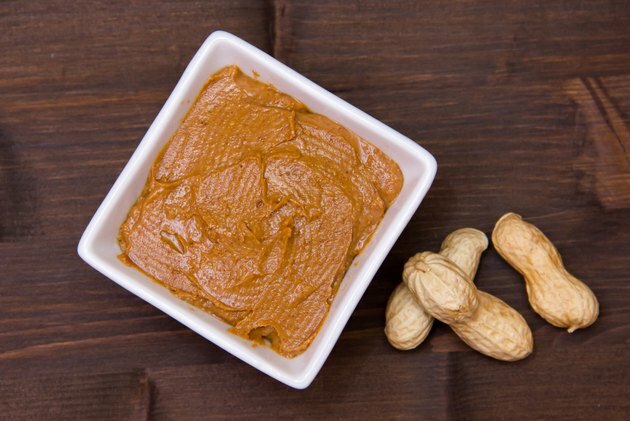 Eaten in moderation, Smart Balance Peanut Butter can be part of a healthful diet. A 2-tbsp. serving of Smart Balance Peanut Butter contains 200 calories. If you use peanut butter as a snack, you may need to eat a smaller portion, particularly if you consume peanut butter with another food such as crackers or celery. Your meal plan may include between-meal snacks, but they should range from 100 to 200 calories. Regular peanut butter is slightly less caloric – 195 calories per serving. Smart Balance Peanut Butter is almost entirely made of fat – 77 percent of the calories come from fat. The 17 g of fat per serving significantly contributes to the suggested limit of 44 to 78 g of fat per day, or 20 to 35 percent of your total calories. That said, very little of the fat is the type that physicians consider dangerous as only 2.5 g come from unhealthy, saturated fat. Regular peanut butter contains the same number of total fat grams, but has 3.4 g of saturated fat. One serving of Smart Balance Peanut Butter provides you with 6 g of carbohydrates, or 4.6 percent of the 130 g suggested for daily consumption. This peanut butter contains 2 g of fiber, a type of carbohydrate. Your daily meal plan should include 25 to 38 g of fiber. Including Smart Balance Peanut Butter in your diet gives you access to 7 g of protein. The protein in this peanut butter is considered incomplete – it does not contain all essential amino acids – but if you spread Smart Balance Peanut Butter on a slice of whole grain bread, it becomes complete. Include 46 to 56 g of protein in your diet each day. Smart Balance Peanut Butter is a rich source of niacin, or vitamin B3. Each serving provides you with 20 percent of the daily value of this vitamin, which promotes the health of your skin and nerves. You will also get a range other vitamins and minerals: 10 percent of the daily value of vitamin E, 8 percent of thiamin, 5 percent of potassium and 4 percent of the daily value of iron. A serving of Smart Balance Peanut Butter has 110 mg of sodium, or 7.3 percent of the suggested limit of 1,500 mg. This is comparable to regular peanut butter, although a serving of regular peanut does contain 2 g of sugar – this is 1 g more than a serving of Smart Balance Peanut Butter. You should limit your consumption of sugar to 37.8 g or less per day.